At StratJuris we perform a technologically driven analysis to assess your existing systems, policies, and processes. Our consultants offer customized services best suited to fit your business needs. Our Privacy and Data Protection Practice encompass expertise of both technology and the lawice in Patents. It represents Large Indian Patent Filers, Indian Tech Startups, Small and Medium Enterprises and Overseas Corporations in the Patent matters in India. The firm works with In-house IP department of companies with large IP portfolios, the firm understands that level of service required has to be adaptive and ensure fulfilment of needs of its clients. The firm offers Data Privacy Audit and Gap Analysis to its clients. Our professionals are Ready for GDPR related advisory work for Indian and Overseas Clients. The firm has legal understanding of GDPR regulations as well as associated Compliance & Audit Framework and IT Controls Assessment and testing. We deploy technical solutions to help conduct regular data audits, streamline, and process data subject requests and remediate violations through a robust incident response plan so that your organisation can demonstrate accountability at each step. FullCA is a Full Compliance and Audit software tool that is designed to work as your virtual data protection officer. Not only is it capable of mapping data across your organisation, it also helps to efficiently conduct data protection impact assessments. Moreover, its friendly interface helps your business to keep track of all processing activities at just a click of a button. The tool also comes with a data breach management system that documents every activity in a defined work flow to help generate a detailed audit trail. Learning Academy brings together our breadth and depth of subject matter expertise with our learning design and technology skills and capabilities. We deliver a range of off-the-shelf digital, blended, and classroom courses on a wide range of subjects, delivered through our secure and accessible online platform. The Academy is our way to bring to you our rich experience of working across a diverse spectrum of clients, solutions and industries. It serves as a centre of excellence that houses thought leadership and best practices observed across our client organisations. 1000M has made several investments in building new skills and solutions so that we can ensure uncompromised excellence in serving our clients. We look to put a renewed focus on how to lead by advising clients in areas of robotics and cognitive technologies, power forecasting, governance advisory, start-ups, cyber security and analytics, to name a few. Through the Academy, we are able to bring our expertise in emerging opportunities to you, in the form of targeted learning programmes ( certified programs). Data has become enabler to the aspirations of every business. 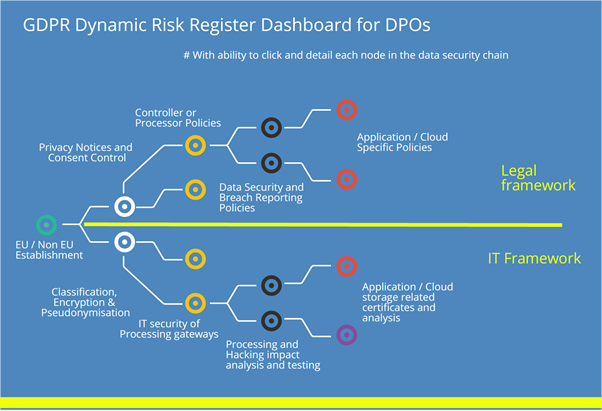 Speed and Scale at which Data is collected, stored, processed and disseminated by the businesses has created “Rightful use of the Data”, a new Risk Category that may become single biggest concern towards ensuring the continuity of the business. Stratjuris provides its clients Legal Expertise combined with transformative power of Technology to implement data security by design in your organization. The Data Privacy Expert Lawyers and Cybersecurity experts at Stratjuris will study your Organization’s Data Collection, Retention and Processing related policies and consents. Once we have created this Data Privacy Gap analysis and we know whether there is spinach in between the teeth we advise you how to bring Legal and Technology controls, so that your Organization Triumphs against any Potential or Actual Data Breach events. The new GDPR Regulation which is mandated to be adopted by May 2018, extends the data rights of individuals, and requires organizations to develop clear policies and procedures to protect personal data and adopt appropriate technical and organizational measures. 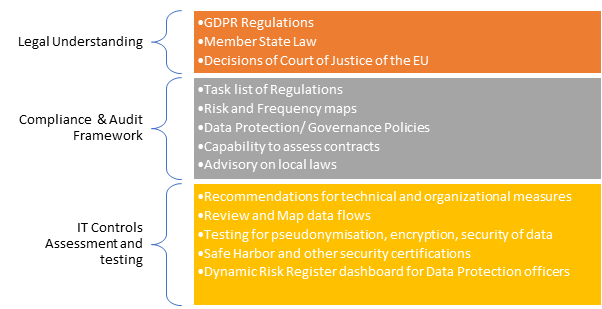 GDPR builds on the existing EU Data Protection Directive, but will introduce challenges in terms of data processing, security, privacy and access, and breach notification. Failure to comply could result in organizations being fined up to 20 million euros or four percent of annual global turnover – whichever is higher. Many organizations in India are unaware of the interpretation of the Territorial scope (Article 3) of the General Data Protection Regulation (‘GDPR’ or ‘Regulation’). Though this Regulation applies to the processing of personal data in the context of the activities of an establishment of a controller or a processor in the Union, it applies regardless of the fact whether the processing takes place in the Union or not. Thus, there may be a scenario that data of a EU subject is being processed in India by an Indian enterprise. Hence, in such scenario, this Regulation applies to the processing of personal data of data subjects who are in the Union by a controller or processor not established in the Union, when such processing activities are related to: (a) the offering of goods or services, irrespective of whether a payment of the data subject is required, to such data subjects in the Union; or (b) the monitoring of their behaviour as far as their behaviour takes place within the Union.